Even though the bone conduction had been used in many fields like audiology, otolaryngology and for other hearing fields but at present it had been used as one of the main hearing aid. Like the other type of the hearing aid the bone conduction headset does not block out ambient noise. How bone conduction headphones work when you on? It occurs when a sound travels through the bone of your skull to you inner ear. The conduction would occur every time when you speak and explain about why does the voice sounds rather higher oblique when you are listening for yourself on a tape recorder. The bone conductor itself offers a deeper full sound and audiologists would know that when the sound travels in the form of waves and when it hits the eardrum it would translate them into a series of the mechanical vibrations. When the sound first enters into the ear your pinna focuses it into the auditory canal and then on the ear drum would get vibrated sympathetically to sound. But when the sound increases then sure there is a lot of possibility for your ear to get damaged. How the bone conduction helps in hearing? Usually a person can able to hear by both ears as well as through using bones and eardrums. Mostly the person can able to hear the sound by eardrums only, it would be thin and coin shaped membrane. The main function of the ear drum is used for transmitting the sound from the air to ossicles which had been present in inside the middle ear. At last the signal gets completely converted it and amplify vibrant in the air to the vibration in fluid. With the help of eardrum the signal gets converted into vibration and transmits them to cochlea. Sometimes the vibration directly reaches the inside of ear neglecting your eardrums this helps for hearing your own voice. For what the bone conduction had been used? The bone conduction headphones acts as the best medical hearing device that is useful for the people who have some problem as like hearing loss. The aid that had been fixed in it is used for transmitting the noise by straight conduction via facial bones and head in the way of the inside ear. It includes the tiny titanium embed or sound processor. This had been designed mainly based on your natural ability to transmit sound that is through the bone conduction system and the sound would get send out in the structure of vibration to the inside ear efficiently through passing inside your middle ear. The bone conduction could have a record and play back option it is because the skull would control the small frequencies enhanced than air, many people are recognized in their own voices to be lesser than other. It can able to help you by giving better crowed or noisy situations. It would allow you for the sound that would helps for many people for improving their speech and understanding. Hearing up with the natural bone conduction would result in the natural sound. When you lost your hearing from one side then there the one implant would works by transmitting the sound. In most cases the hearing loss happen due to the damages that had happened to your eardrums. But the bone conduction does not make use of eardrums. 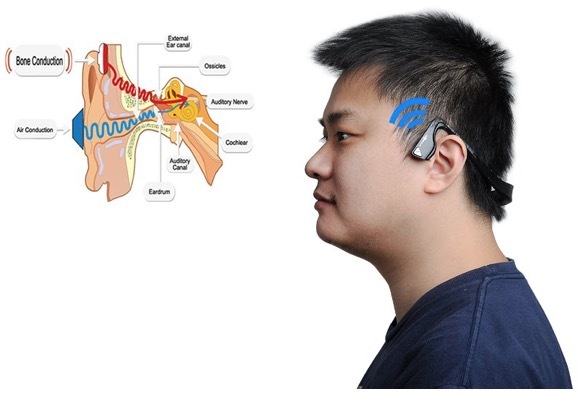 Those who have hearing problem can able to hear clearly with the help of the bone conductions. These headphones are designed in the comfortable manner and it would suit inside your budgets. After wearing it sure you would get some changes and this would suit best for the person who get bored and irritated of using the old type of headphones for too long times. These headphones are cool in design and good for you to use. Check out what the experts have to say about AfterShokz bone conduction headphone. It seems to be wireless and designed for a safe component from the earbuds and the different earphones technologies. It gives a high quality of sound. It would be lightweight, sweat proof and has a multi pairing and gives a comfortable situation. This headphone is easy for you to set up and its design would be classier. You can able to hear everything with the clear sound quality. It acts as a perfect fit for your ears and give you a comfortable feel. It is fast as well as it gives you a complete security for your ears. As like this you can able to find out the massive of design and featured bone conduction headphones. While picking them when you compared its features and picked up the best then sure through that you can able to avoid the hearing problems and enjoy everything. Good post full of information. It looks a like good gadget for people with hearing difficulties. Great innovation which will benefit millions of people around the globe.